Only 3 ingredients make up our favorite El Bee’s margaritas. Delicious, but beware, they pack a punch! In July, we pack in two trips to the lake to enjoy some family time and sunshine. We spend long days on our boat, eating sandwiches from a picnic basket, floating in the water and just enjoying each other. Once July is over, it’s suddenly all about “back to school.” It seems that it just starts earlier and earlier every year. It makes me sad when it’s time for them to go back. Summertime just goes by too quickly. Yesterday we returned from Table Rock lake in Missouri. My husband’s sister and her husband recently brought a house there, and invited us down for the week. We had a wonderful time, and enjoyed our week with them very much! 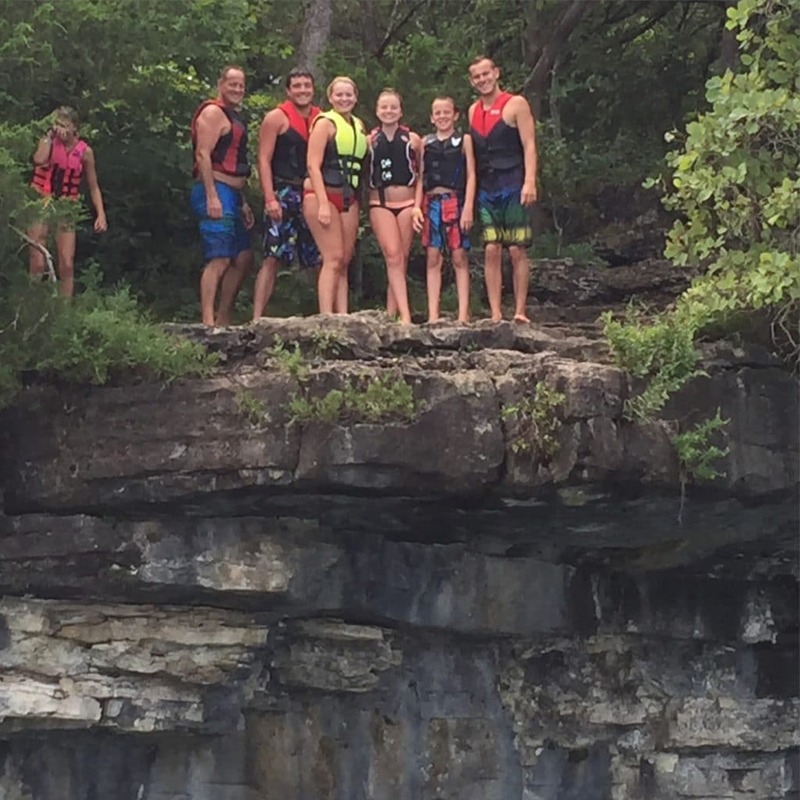 The kids (and the hubby) really enjoyed the cliff jumping. I was happy to stay in the boat and snap photos of them. I have a huge fear of heights, and trust me, I didn’t feel left out, not one bit. Our VERY favorite margaritas come from a Mexican restaurant in our area called El Bee’s. It’s been around for as long as I can remember, and their fresh salsa and food is delicious …but their margaritas are the BEST! I must warn you though, they pack a serious punch, so drink with care! So, I may be a “day late” for sharing, but I promised you a new recipe today, and this one is perfect for the weekend. 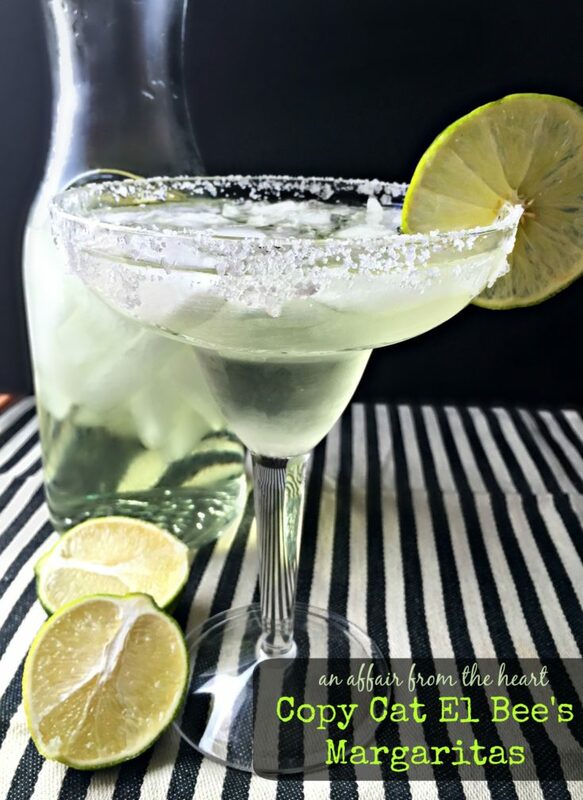 I got this recipe from a source that knows just how they make their margaritas at El Bee’s… so if you have been there and you love them like we do, you will be so excited to have this recipe to try at home! We like to serve them, like they do in the restaurant. Two salty glasses, and a one quart carafe. We take our margaritas over ice, not blended…but you could blend them if you desire. Only 3 ingredients make up our favorite El Bee's margaritas. Delicious, but beware, they pack a punch! Fill a one quart pitcher with ice. Add tequila, triple sec and lime juice. 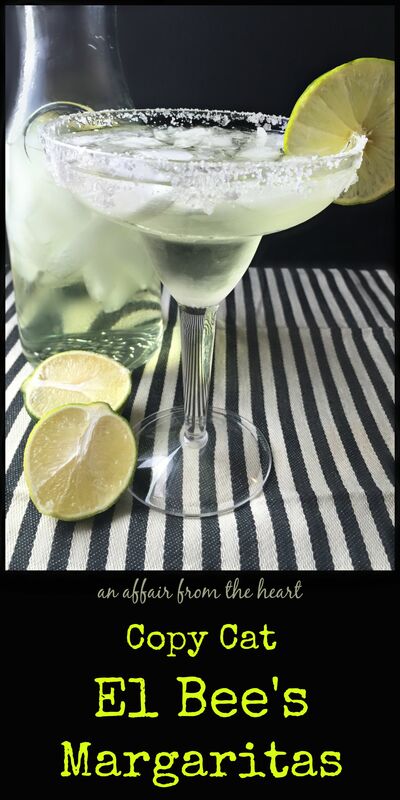 Serve in a glass with a salted rim with a lime. This recipe makes a one quart pitcher. If you want to make one drink, just use equal parts tequila and triple sec, 1/2 Rose's lime juice. You could try other tequilas, but to get it just right, use Sauza Silver. Cheers to you, my friends, I hope your summer has been delightful!